Recently, many students were shocked to hear about citations issued after several students completed the History Comprehensive exam. The tradition of “comping” someone, meaning, waiting for them to finish their comp, then showering them with alcohol, confetti, treats, and affection, has often appeared University sanctioned because these celebrations happen in or around academic buildings. However, the University’s rules against public display of alcohol, even by those of legal drinking age, have been in place for some time. Grace Shaw (C’15) was issued a citation for comping Taliaferro. “As someone who will be comping next year, I would love to celebrate in a tradition I have come to know and appreciate well at Sewanee,” said Shaw, who attributed the stricter enforcement to hospitalizations of comped students. She added, “Comps are like all drinking at Sewanee: it is their decision on how much and when to drink.” Both Taliaferro and Shaw are over 21. 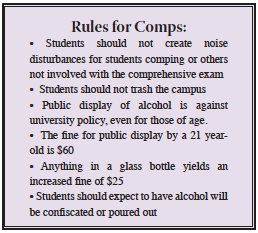 The problematic parts of comps for Bruce, and the entirety of the administration, go beyond public displays of alcohol and noise complaints. “The trash that’s left behind” is another major concern for Bruce. “The people have to know that Silly String [and] glitter are not biodegradable. It’s not just the beer bottles or whatever, it’s these other things. And that’s just disrespectful to a campus that we care a lot about,” Bruce stated. Parties celebrating the comprehensive exams held by the departments, including the legendary English Comp Party thrown by Dr. John V. Reishman, will not be affected. Bruce prefers these parties to the immediate celebration because they are undisruptive to others, removed from central campus and focused on the appropriate audience. The public display policies apply throughout the school year. All students, regardless of participating in comps, should keep this in mind on weekends, especially party weekends. There is what Bruce describes as an “uneasy truce with fraternity front yards,” but elsewhere, alcohol should not be carried in the open.